Golden Apples: Look What I Got! Right from the beginning, Knitty City has had great bags—Not just the kind for sale, but the kind you get with a sale (purchase). 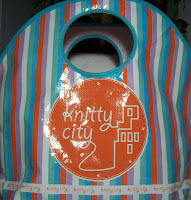 Knitty City bags become instant project bags. Clear, sturdy, large enough to hold a project (OK so not large enough to hold an afghan, but plenty big for a small sweater) and closeable. This bag is BIG—about 18 inches from side to side, with a big flat oval bottom (so it easily sits flat) and tall (9 inches from bottom to bottom of hand hold) and very sturdy. Not afghan project sized, but a nice size for lots of projects. So yesterday was a 3-fer! 1—I was able to retrieve my current project (the Fruity Neck Ring) and notions bag (a joy it wasn’t lost! )—No photo—well because I not much of a change in the project—it is 6 or so stripes longer than it was last time I photographed it—but that’s about it! 2—I got the great bag (see above) –I know, I need another tote bag as much as I need to gain weight—but it is a great bag! 3—And 3 balls of some solid colored sock yarn. That was the hardest part! Knitty City has a fairly large selection of sock yarn—I knew what I wanted in the most general way—50gm balls of solid colors-- but Oh, my! How hard it was to choose! But—I don’t have much in the way of brown clothing…and I don’t think I want brown socks. And I was tempted by the RED—Oh what a lovely clear red! The deep cherry pink was tempting too, but I have a skein in that color already. If there was a middling green, and not just the rich bottle green and the light grassy green, I might have gotten a set of greens… I am always surprised by how many green clothes I own-and in so many different shade of green. What will I do with them? OH so many things! First off, they are almost 200 yards each—and I know, 160 yards skeins will often knit up to perfect length socks for me.. So I have plenty of yardage. Second—I have a full skein of a darker purple (and some white that could, with a small effort become a pale purple!) and I could easily use the solids together—they do make a lovely spring combo all on there own. I could use a small amount to add some patterning to a pair of socks made (mostly) with some plain but boring color –like oatmeal! Work up a stripe pattern of my own—black socks with stripes, using these yarns and some of the other solids in my collection. I love having clear solid colors to trim socks; I like being able to add small details to self striping socks, and solids are great for lace trims, or other details. What will I do?! Well time will tell! For the past 48 hours--the news has been nothing but SNOW...And I know the mid Atlantic states are getting more than their fair share. But here in NYC? Drifts of an inch or so! You're right--solid color sock yarn is VERY hard to find. Lucky you! Hmm... may have to make a run to Knitty City tomorrow. Those are great bags! I'm impressed that you got any snow. Up here in the Bronx: NUTTIN. Ooh, let's hope that's all the snow you get. If we had gotten that much this morning, the jeep would have gotten parked ! My husband's stroke recovery is going pretty well, Praise the LORD, but now he's in a nursing home to recover from a broken hip he received this past Monday when he fell on the icy street. He's in good hands, and will be better soon ! We appreciate your well wishes and I hope to remember to try to find the book that you mentioned. On the sock front, I like solids too......they show patterns beautifully, and I always like to have extras--I use them for contrasting heels and toes.....LOVE THAT !